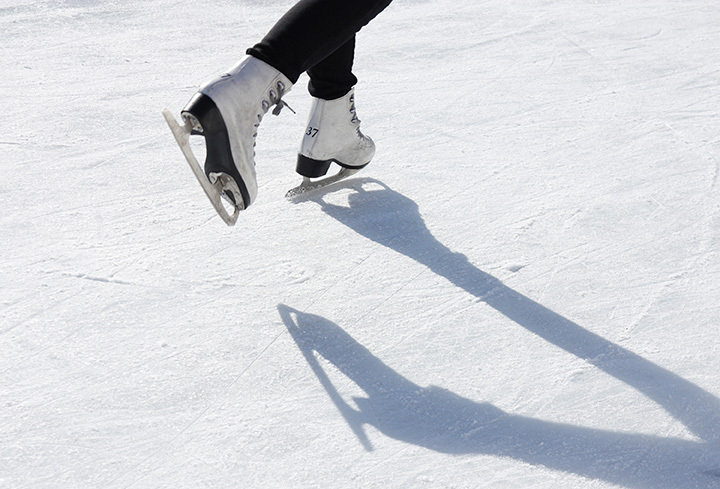 The 10 Best Ice Staking Rinks in Maine! During the winter, there is no shortage of snow, ice, and cold weather in Maine. While some people like to hide by the fire with a big cup of hot chocolate, many hearty souls are outside enjoying the beauty of Maine in the wintertime. Many Mainers choose to live in Maine year-round because they love the winter. Maine has activities for everyone to enjoy from downhill skiing at some of the best ski resorts east of the Mississippi to miles and miles of Nordic ski trails to hundreds of ponds and lakes to ice fish and ice skate. Whatever your interest, the Pine Tree State has something just for you. Opened in 2015 for the first time, The Rink at Thompson's Point was a huge hit. This 10,000 square-foot arena is located under an open air pavilion. But don't worry about getting cold as parts of the rink are heated to keep you warm and toasty as you twirl about the ice. Check out the website for themed skate nights and holiday events. Located just off of Main Street behind the town's Log Cabin municipal meeting building, the Orland H. Blake Skating Pond is constructed every winter on the picturesque marsh. The rink is opened daily and it is lit until 11 p.m. Feel free to bring a puck, but be warned when the ice is crowded you'll have to play at the back of the rink. After a few hours on the ice, warm your frozen toes by the stone fireplace in the adjacent warming hut. Every hockey lover in Maine will spend time at the Androscoggin Bank Colisée in Lewiston. The Colisée is home to the youth hockey team, Fighting Spirit. With a team of passionate hockey coaches, the Colisée is committed to the development of the sport in Maine youth around the state. If you have a child who loves hockey, the Colisée is the place to be on the weekends. Kennebunk is one of Maine's most iconic coastal towns. During the winter months the town opens a covered, open-sided ice rink in the middle of the town's quaint downtown. The Waterhouse Center rink is opened daily from 7 a.m. to 9 p.m. and is maintained by the community's own Zamboni. Grab your skates and hit this rink for free. Fancy skating on a real pond? Goddard's Pond in Bath is a large pond maintained by the town open for free public skating during the winter months. Since the rink is a real pond, there are times when the ice is not safe for skating. You'll have to look for signs indicating if the ice is safe or not. The pond features a warming hut, concession stand and bathrooms from dawn to 9 p.m. daily. Just down the road from Maine's capital city of Augusta, the Camden National Bank Ice Vault has everything from public skating to figure skating lessons to hockey games. If you are serious about ice sports, this indoor arena is open year-round for you to hone your skills. Sugarloaf might be famous for its skiing, but if skiing isn't your sport or you need to rest your legs from a day on the slopes, hit up the Sugarloaf Outdoor Center Ice Rink. The Outdoor Center boasts an NHL-sized outdoor rink with a full line of ice skate rentals for children and adults. Pick-up hockey games are available on Tuesday and Thursday evenings. In 2012 the city of South Portland built a large outdoor ice rink at the Wainwright Recreation Complex. This simple rink offers nice views of the open fields and is lit for night skating. There are no skate rentals, but the site also contains cross-country skiing trails, too. The large outdoor ice rink behind Wentworth School in Scarborough is divided into two areas, one for hockey players and the second for just public skating. The Scarborough Ice Rink is a great place for young kids to enjoy the ice without the worry of getting hit by a rouge puck. There's a nice indoor space for dressing and a concession stand with snacks. Opened during the winter of 2015 and named after its longtime caretaker who died shortly after the rink liner was rolled out, the Bruce Fox Memorial Ice Rink offers a warming hut and skate rentals. This rink is popular amongst the locals. Maine is home to numerous indoor and outdoor ice rinks during the long winter months. Instead of hiding inside by the fire, head outdoors and enjoy some of the best ice staking rinks in Maine. View more Maine Ice Skating Rinks.